This is the end product of one of my fall hats. This is my own © design. I have more hats coming and some crocheted socks. This hat was made with aurora 8 from Karabella yarns, it is 100% merino wool and it is very nice to wear. I carried the two colors throught most of the work. 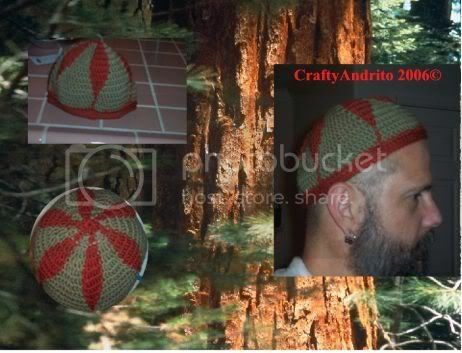 It was a very fun hat to make,. CraftyAndrito's original. Anyway thanks for stopping by I have more hats in the making, I may even dare to knit one on Lamb's Prode wool, but I have to do it while I am in the mood for knitting LOL. See you soon! I love how it came out! You should submit the pattern to Debbie Stoller! Oooooh, that one is grooooovy!